Why is the RDSBC Needed? 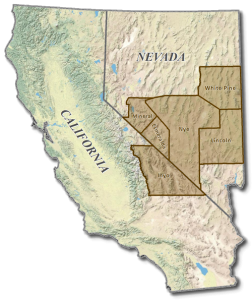 Map Showing the location of the five RDSBC counties in Nevada (Esmeralda, Lincoln, Mineral, Nye, and White Pine) and the one county in California (Inyo). The Rural Desert Southwest Brownfields Coalition covers an area spanning 55,363 square miles of land and with a population of about 83,442 (2010 Census). The Federal Government controls from 97% to 99% of the land in each of the Coalition counties. This leaves only a small fraction of land open to private development with revenue generating potential for local government entities. 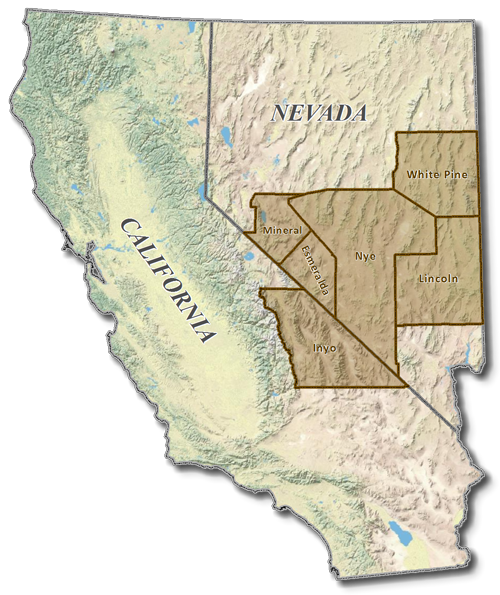 In addition, expansive wilderness areas and undisturbed lands are prevalent throughout these rural, desert southwest communities, which further restricts where development can take place. For most of their histories, mining has been the predominant industry in the Coalition region. Mining was the primary catalyst for the development of many rural towns. The boom and bust nature of this industry has significantly contributed to economic instability in the region. It has also left a legacy of mine-scarred lands on both public and private property throughout these counties. The blight and contamination on mine-scarred lands and former manufacturing, industrial, and other disturbed sites deters development from taking place. The Coalition members are committed to economic diversification in order to protect their communities from being solely tied to the successes and shortfalls of a single industry. The Coalition counties are each struggling to grow and attract new businesses, while preserving the rural character of their communities. Like many rural locales across the United States, these counties are finding it difficult to attract residents and new businesses, when at the same time many existing businesses are closing and cutting back. There is a need to foster business development, create employment opportunities, and generate revenue in each of the Coalition counties. Development of renewable energy resources offers vast potential for economic development and diversification. The Coalition’s solar resources are among the best in the nation and are suitable for both concentrated and photovoltaic power generation. Wind, geothermal, and biomass resources are also disbursed throughout these county jurisdictions. The Coalition recognizes that renewable energy presents an opportunity for financial solvency in the long term. However, the Counties also recognize that reliance on one industry can lead to economic constraints, as was the case with the communities’ dependence on mining and military installations. Some renewable energy development is currently underway, but the Counties struggle to attract businesses in this industry due to blight and suspected contamination, limited infrastructure, and massive public ownership/management of land. In order to address these concerns, the Counties have joined forces to encourage responsible development and efficient use of resources, which is the key reason they are promoting redevelopment of brownfields and previously disturbed lands. Previously disturbed lands, where blight and contamination exist, are the prime locations for any future developments. Mine-scarred lands offer a key opportunity for renewable energy redevelopment because they tend to be large properties located near existing transmission and other necessary infrastructure. But these properties must be assessed and cleaned up in order to effectively market them to new business interests. To assist in these efforts, the RDSBC is working to identify and assess blighted and contaminated properties, prepare the sites for cleanup and reuse, and create an area-wide plan that will enable responsible redevelopment. The RDSBC understands they must take a hands-on approach to ensure that their communities prosper. They are working to foster the development of renewable energy generation facilities and supporting businesses, particularly on previously disturbed properties, to transmit clean power to markets throughout the desert southwest. The Coalition is committed to working together to achieve successful clean energy redevelopment of brownfields in these rich renewable resource areas. What is the RDSBC Project? The Coalition counties are working together to identify and assess properties where the perception and potential presence of contamination is hindering redevelopment and reuse. A major component of the Coalition’s program is to develop an area-wide plan for the six Counties in the Coalition with respect to cleanup and reuse of identified brownfield sites. Promote economic development and diversification through water-efficient renewable energy, particularly renewable energy development on former brownfields. Work with local, state, and federal entities to promote national initiatives in the Coalition area, particularly initiatives related to redeveloping brownfields with renewable energy generation facilities. Site Identification/Selection: The Coalition and community partners will establish a list of selection criteria and two prioritized inventories of sites—one for Hazardous Substances and one for Petroleum. The Coalition will select a minimum of 20 sites for assessment (with at least one per County) based on the prioritized inventories. Environmental Site Assessments: Assessment services including Phase I Environmental Site Assessments, Quality Assurance Project Plans, Health and Safety Plans, Sampling and Analysis Plans, and Phase II Environmental Site Assessments will be performed. It is anticipated that more than 20 sites will be selected for Phase I assessment, and up to 5 sites will require Phase II assessment. One property, at a minimum, located in the jurisdiction of each Coalition member will be assessed for potential contamination by hazardous substances and/or petroleum. At least 1 site per Coalition County will be cleared for redevelopment and marketed with the support of local community organizations and other stakeholders. Cleanup/Reuse Planning: Six cleanup/reuse plans will be completed and at least one public meeting per plan will be held in the affected community. The Coalition will target 50 acres for reuse as open space. Area Wide Planning: The Coalition will prepare an area-wide plan focused on renewable energy related redevelopment potential and opportunities for open and/or green space designations. The purpose of the area-wide plan is to create a foundation for future clean energy development throughout Coalition territory, which will enable the Coalition to take a holistic approach when planning to prevent future blight and inefficient use of resources. The area-wide plan will take into consideration availability of suitable, existing infrastructure, required upgrades to infrastructure, concentration of renewable resources, open space considerations, and community concerns. The Coalition will hold at least two public meetings per County to provide the communities with the opportunity to contribute to the planning process. Community Outreach: The Coalition is dedicated to ensuring community participation throughout the implementation of its Brownfields Program. Community meetings will be held for each cleanup/reuse plan in the affected community and ten County-wide meetings will be held for the area-wide plan. The Coalition members entered into a formal Memorandum of Agreement (MOA) in August 2011. The RDSBC assessment and planning project officially commenced on October 1, 2011, and has a projected completion date of September 30, 2014. The Coalition’s project places high importance on valuing communities and neighborhoods. The Coalition will involve the communities in the target areas in every step of the process to ensure the unique characteristics of the communities are preserved, particularly wide-open spaces and natural environments. The Coalition’s goals will be achieved through the program activities, with redevelopment and reuse of property being the primary aim of the program. Redevelopment in Nye, Esmeralda, Lincoln, Mineral, White Pine, and Inyo will create jobs, increase revenue, and diversify the economy. By involving the community in each step of the process (ranking, selection, reuse, and planning) the Coalition will ensure grassroots, long-term support of the community’s Brownfields Program. Once the potentially contaminated sites are assessed and plans to mitigate any contaminants and redevelop the sites are established, the Coalition members can move forward with plans to improve residential and community facilities, cultivate business and industry in the area, and develop open space.